Need a last minute Mother’s Day gift idea? 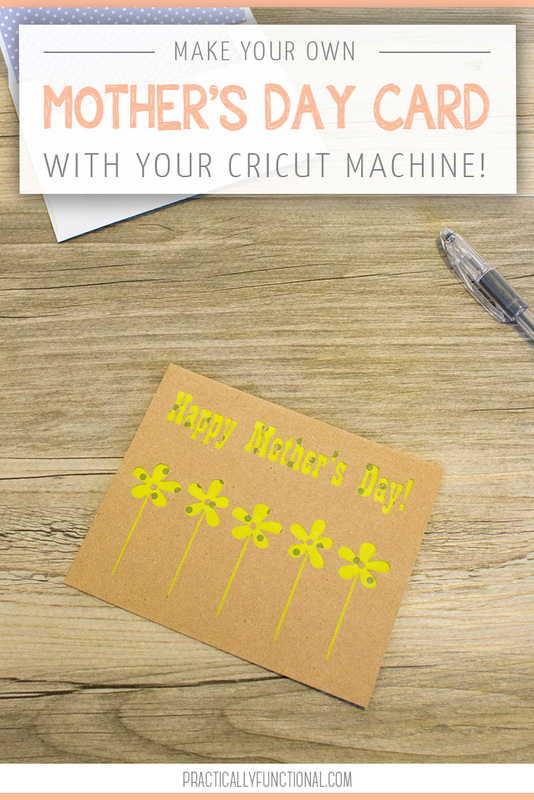 This handmade Mother’s Day Card is an easy gift that is perfect for a spa day gift card! Ever since I became a mother I’ve started to truly understand what my mom went through all these years… Turns out, she’s a rockstar! 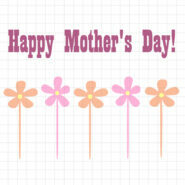 In fact, all mothers are awesome! 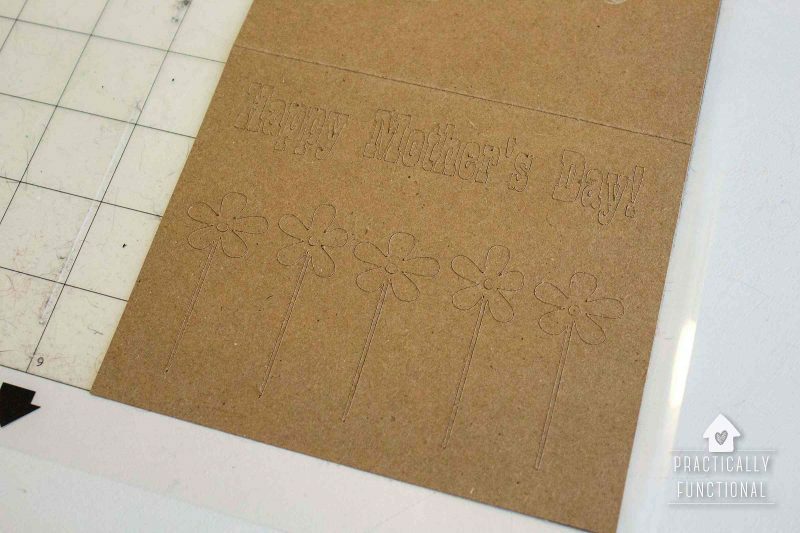 So what better way to show how much we love them and care about them than with a handmade Mother’s Day card?! 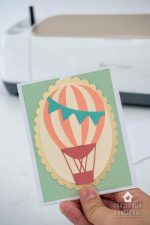 These cards are super simple to make, and you can completely customize them with fun colors or patterns on the papers you choose! 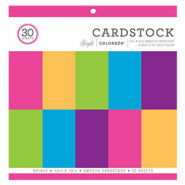 Start by creating the base of the card itself. This card is 5″ x 4″, so cut a rectangle out of kraft paper that is 5″ x 8″ (twice as long as the finished card so you can fold it in half). 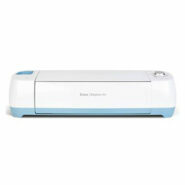 Open up Cricut Design Space and upload the SVG file. 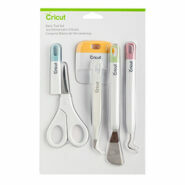 You can see my full tutorial on how to upload your own image to Cricut here. Once the design is uploaded into a new project, change the image to whatever size you want and click the green “Make It” button in the top right corner. 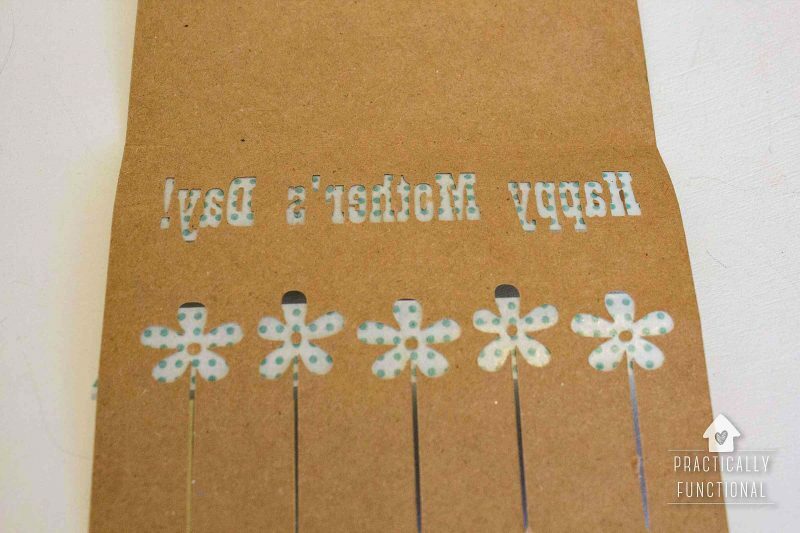 Follow the on-screen instructions to prepare the mats and then send them to the Cricut for cutting. Weed away the cut out shapes and letters, but make sure to leave the center pieces for the flowers and letters like “a” and “o”. 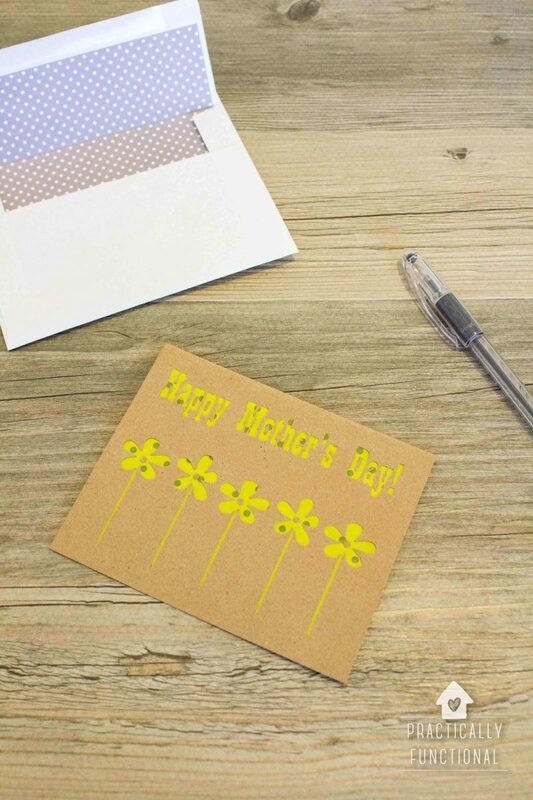 Apply a piece of transfer tape or washi tape over the project (making sure to cover the flower and letter center pieces that aren’t connected to anything else) and gently peel the card off of the cutting mat. 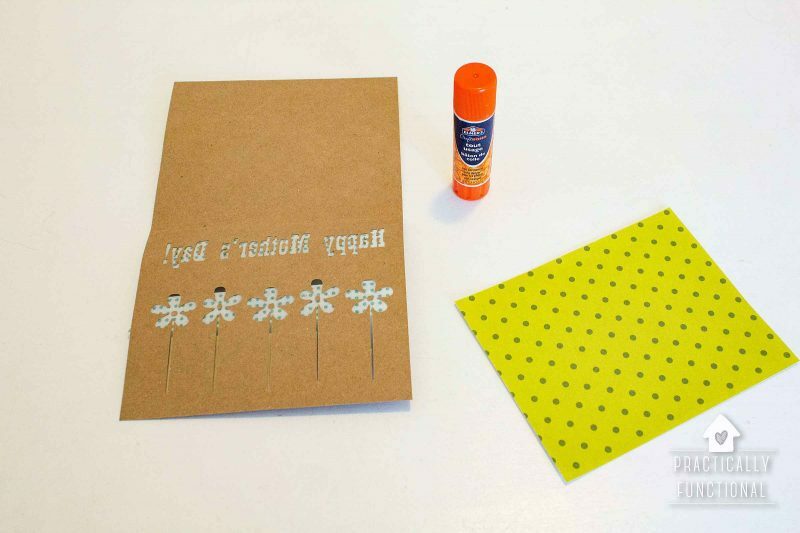 Cut your patterned paper to size to fit inside the folded card. Then, using a glue stick, glue the paper (patterned side face down) over the cut out portion of the kraft paper card so that the pattern will show through the cutouts. 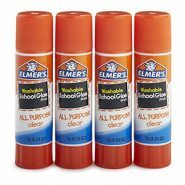 The glue will dry after a few minutes. 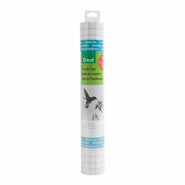 Then, gently peel the transfer tape off the project, and you’re done! 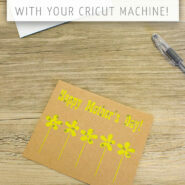 Your mom will love this homemade Mother’s Day card! 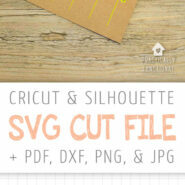 This SVG cut file comes bundled with a PNG and JPG file as well, so you can use it in whatever software you’d like! Well, anything you want! I made this card this time around. 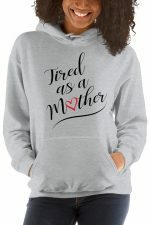 I also love to make baby onesies, t-shirts, and mugs with vinyl, or you can also make Christmas ornaments, tote bags, cards, plates, holiday decor, and more! Where do you get your vinyl and fun cutting materials? 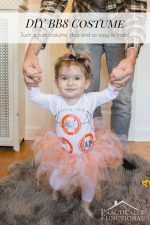 I get all of my fun cutting materials from Cricut.com. They have vinyl and paper (of course), but they also have tons of other fun stuff like craft foam, leather, chipboard, foil acetate, window clings, and more! I also go to Expressions Vinyl for my adhesive and iron-on vinyl sometimes because they have tons of fun patterns and you can buy a larger roll if you need a lot for a project. Can I sell items I make with these cut files? If you would like to make items to sell, you can purchase a commercial license here. I’m already a subscriber…do I have to enter my name and email address again for every free SVG cut file? Want to share this SVG cut file with your friends? Just click any of the share buttons on the left to share with Facebook, Pinterest, Twitter, etc. !